This photograph shows a suitcase and possible contents that a young lad might have had when he was evacuated in the Second World War. 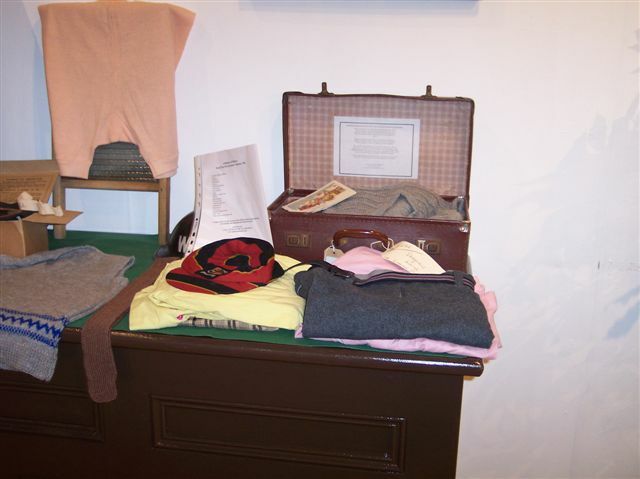 It was part of an exhibition of local memorabilia from the Archives of Tullie House Museum, Carlisle, Cumbria on display during August 2005. This coincided with a touring Imperial War Museum Exhibition at Tullie House marking the 60th Anniversary of the end of the Second World War. It was a good way of showing how the war affected even young children. People of all ages visited the exhibition including a lot of children with their parents or grandparents. The Wikipedia is a superb concept and many world experts have contributed to it. It is completely free and accessible to all. Unfortunately a few are abusing that freedom of access. American politicians have been discovered doctoring their biographies, editing out anything that shows them as anything but shining white. Others are distorting history for nationalistic reasons. A case in point is the 1946 London Victory Parade which Polish nationalists. and perhaps others who are well-intentioned but ill-informed, persist in seeing the parade as a slur on them. I have edited this article several times, most recently this morning. This time I have left the accusation untouched but added a word of explanation. The one really democratic state in central Europe before WW2 (the term Eastern Europe really refers to the post-war Iron Curtain era) was Czechoslovakia. In Poland there was an expansionist military dictatorship governing a highly anti-Semitic state. We hear very little now about the Union of Young Poland an out-an-out fascist and violently anti-Semitic organisation and the major pre-war party. When Czechoslovakia was dismembered in March 1939 (after the Munich Agreement of September 1938) Poland and Hungary rushed in to grab what they could. Hungary taking a huge swath of Ruthenia in Slovakia and Poland further chunks of territory. But this was nothing new. Polish international agression has all but been brushed out of history except in academic books. In March (16-19) 1938, taking advantage of the international situation created by the German annexation of Austria, Poland sent an ultimatum to Lithuania demanding territory as 'a regulation of relations' between the two countries. Lithuania yielded on 17 March. Then on 29 September 1938 a Polish Note was sent to Czechoslovakia demanding the secession of the Teschen area. The Czechs, face-to-face with the threat of German invasion were obliged to yield, and on 2 October 1938 Polish forces occupied Teschen (this, mark you, was before Munich). Then, in the discussions following the Munich Agreement the Poles ardently championed the Hungarian claims in Slovakia and tried to secure a common frontier with Hungary. But these devious schemes were thwarted and frustrated by a bigger vulture, Germany. The German-Polish crisis flared up in March 1939, not before then. Now here we have a breath-taking article on the betrayal and hypocrisy of the West (read 'Britain'). Even the Baltic States are thrown in, all three of which were under forms of dictatorship and had all concluded pacts with Hitler. They were annexed by the USSR after WW2 began. 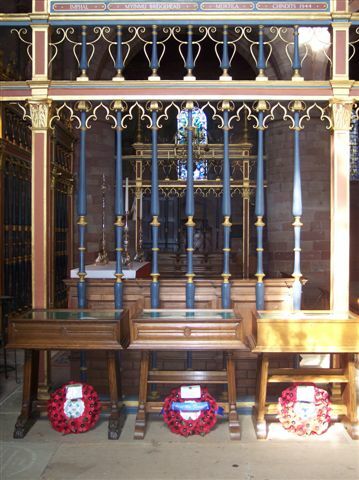 In Carlisle Cathedral, Cumbria there is a Regimental Chapel for the Border Regiment, the traditional county regiment for men from the former counties of Cumberland and Westmorland. Photographed here are the three 'Roll of Honour' registers at one side Chapel. The Register in the cabinet on the left lists the names of those men from the regiment who lost their lives in the Great War, the middle cabinet has the Register of those who lost their lives in the Second World War, and the one on the right commemorates those who lost their lives serving with the KORBR between 1959 and 2006. At the other side of the Chapel are Memorial tablets commemorating those who lost their lives serving with the Regiment at other times, such as the Boer War. The Chapel does a fine job in ensuring regular and casual visitors remember the sacrifice of the many Fallen comrades who served with the Regiment during its history. Near the Altar is yet another Register listing the names of couples with Regimental links who have been married in there. So, happy events as well as sad ones are remembered in this Chapel, just like in a 'family'. Sorry, I haven't been keeping up with this site of late. been to busy with oter things. I thought this site might be of interest -the CBC archives. It has a lot of archives from WWII, particularly Italy. Mathew Halton is one of the more famous radio correspondent. Does the BBC have an archive page? I have added another new link in the right column, to the 4th Queen's Own Hussars war diaries. I have added a new link in the right column, to the official US Army history. Found by Ron. 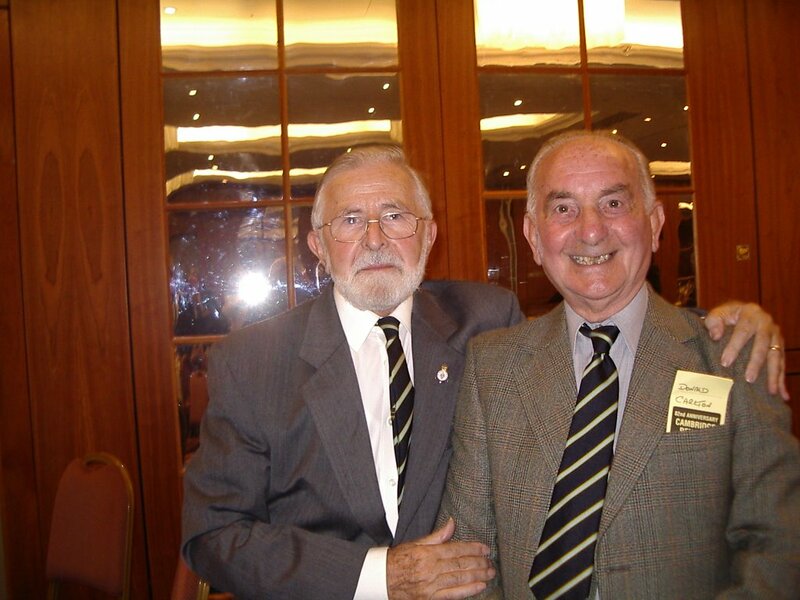 C&BG Boys Club, The club that produced heros. Last night, in London, I went to a re-union of that club and was delighted to meet up once again with Donnie who had travelled down from Bristol for the occasion. The club, which started in 1924 and closed down in 1989 still draws over 130 ex-members or sons of ex-members to its reunion and friendships forged, in my case, over 70 years ago are still as strong today.